Good soil is an important factor in agriculture. Soil is not just mass of inert material that supports plant growth. In addition to the physical components like the sand, silt and clay, soil has a universe of its own comprising abundant micro and macro fauna. I would like to abbreviate SOIL as Source Of Infinite Life. It’s very important that the fertility of the soil is maintained through the regular addition of appropriate compost and other suitable organic manures to enhance the organic matter and humus contents in the soil. It helps to build a fertile soil structure which facilitates the plants to optimize the use of water and nutrients. Microorganisms make soil alive and productive besides aiding disease and pest resistance. Compost enhances the population of such beneficial microbes in the soil. Studies have shown that every increase in 0.5% of organic matter in soil can conserve 80,000 litres of water in one hectare of farm land. Water crisis in agriculture is a major problem globally which can be addressed locally by enhancing the soil organic matter. Composting is the microbiological decomposition of organic matter into a relatively stable humus-like material. It is a natural biological process, carried out under controlled aerobic conditions (need oxygen). In this process, various microorganisms like bacteria and fungi, break down organic matter into simpler substances. The effectiveness of the composting process is dependent on the environmental conditions present within the composting system i.e., oxygen, temperature, moisture, material disturbance, organic matter and the size and activity of microbial populations. 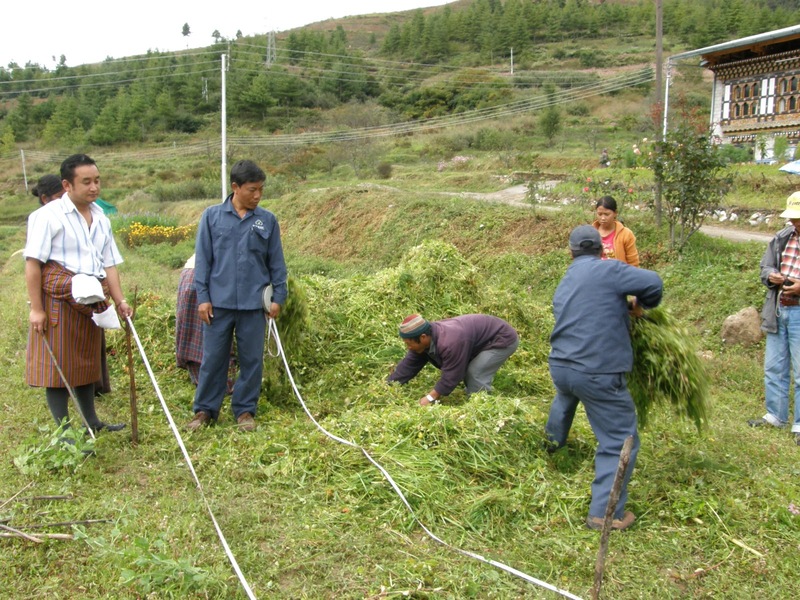 It is an efficient method to recycle the agro-wastes to valuable organic manures. Organic manure influences the plant growth and improves the soil structure and water holding capacity. A variety of biodegradable wastes that are available in the region like forest litter, poultry, sheep, goat and pig droppings, biogas slurry, fish pond sludge, weeds, oilcakes, green manures etc. can be used in composting. When organic matter is allowed to decompose it undergoes a series of changes resulting in a granular, humus rich material called compost. Generally, composting begins at mesophilic temperature and progresses into the thermophilic range. In later stages of composting different organisms and insects like actinomycetes, centipedes, millipedes, fungi, bugs, and earthworms assist the process. When organic materials are broken down in the presence of oxygen the process is known as aerobic decomposition. Under these conditions microorganisms which utilize oxygen to decompose organic matter and assimilate carbon, nitrogen, phosphorus, sulphur and other nutrients for synthesizing their cell protoplast. Heterotrophic organisms take energy from the decomposition of organic matter (OM), resulting in production of CO, and humus and releases some of essential plant nutrients. Carbon functions as energy source required for cell protoplast. In the aerobic composting process, the temperature of the compost heap reaches about 70-80 degrees centigrade which aids in killing weed seeds and pathogens. In addition there will be no foul odour during composting unlike the anaerobic composting. (a) The kind of materials to be used. (b) Collection and transportation of the material. (c) Sources of water supply. (d) Transportation of the finished compost to the field. (e) Distance of the field from the site of composting. The compost heap should be located with the long side at right angles to the direction of the prevailing wind and use the existing wind breaks (buildings, trees) as shelter to prevent drying of composting materials. The shade helps in preserving the moisture. Also there should be enough space for the turning of the compost heap. Basically there are two structures in which wastes can be decomposed. Mainly composting is done in a heap or tank like structure with perforations for air flow. Any one of these can be used. Heap does not require any cost and is easy to manage. allowed to wither a little. 2. Rough and coarse materials such as stalks of maize, cotton, millets etc. must be broken or chopped before use. The ideal length is around 5 cm. These materials can be broken by spreading them in the cattle shed, it will also help in collecting urine and dung properly. Plants like water hyacinth and Ipomea sp. can be used as these decompose fast. 3. Woody materials such as sugarcane trash, tree bark and saw dust should be moistened before putting to the heap, preferably by soaking them in water for 3-4 days. The dimensions of the heap are width 2m, height 1m and the length depends on the quantity of the material. At the base of the heap a layer of old branches should be laid as this would provide aeration and prevent water logging. On the top of it alternate layers of different types of plant materials and dung are laid which have high C: N ratio. The layers should be about 30 cms for plant material and about 10 cms for the manures. Also little soil should also be added in the heap in between. Layers should be watered if material is very dry. 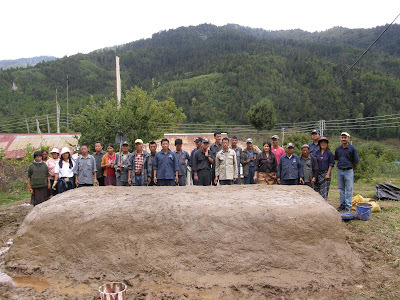 When the heap reaches the desired height ventilation holes are made by pushing pointed wooden or bamboo poles vertically into the heap about 1 m apart. When the heap is finished it can be covered with soil or straw. The ventilation poles can be removed on the second day. After 4-5 days these holes should be plastered to prevent the loss of heat and moisture. The heap is turned so that the material from the edges where the temperature is lower is moved to the centre where it is warm, while centre of heap does not suffer from overheating. 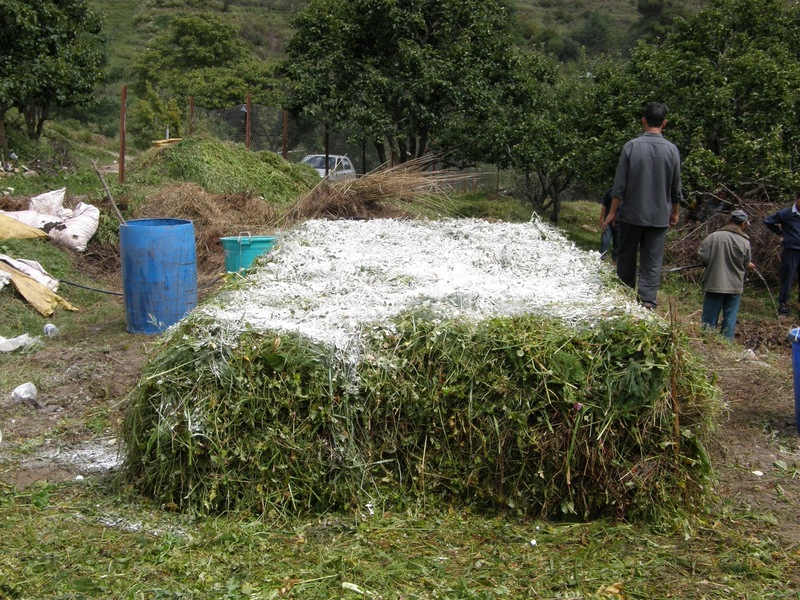 All the materials in the heap should be exposed to the heat in order to kill germs, weed seeds, insects and also to speed up the decomposition. Turning also improves aeration of the heap. The first turning should be done after 2-3 weeks of heaping, when temperature has started to drop after reaching a peak. The heap can be turned again after three weeks of first turning. If the heap is prepared properly, not made compactly, holes are made and proper ratios of residues having different C: N ratio, is maintained; only one turning of the heap is enough. 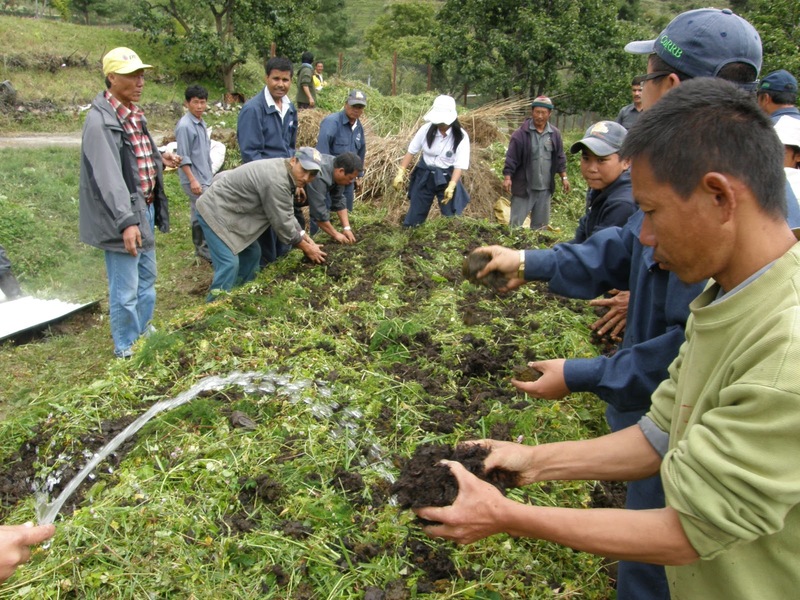 The time required for the heap to mature and become good compost, depends on the local climatic conditions and the materials used. If the weather is warm, the heap is moist, well aerated and good combination of materials is used for building the heap, the compost is ready in three months time. In colder or dry conditions and dominance of materials with high C: N ratio, heap usually takes 2-3 months to ripe. When the compost is ripe the material is converted from dark brown to grey colour, gives an earthy smell and is coarse. The volume of the mature heap is reduced to half of the original. Some of the important factors that affect the decomposition of organic materials are carbon/nitrogen (C:N) ratio, shredding, moisture, aeration, temperature and pH. The ratio of carbon to nitrogen (C: N ratio) defines the relative quantities of these two elements in the crop residues. The process of converting organic materials into the manures is chiefly microbial and therefore influenced by the proportions of carbonaceous and nitrogenous materials. Wider C: N ratio materials will take long duration to decompose. The C: N ratio of organic materials range from 30: 1 to 80: 1. However the C: N ratio of compost is less than 20: 1. Thus to reduce the time of composting when hardy materials (high C:N ratio) it is advisable to use organic nitrogen sources like legume residues and green plant biomass. To activate the composting process the cellulolytic fungus like Trichoderma sp. can be used. Microbial decomposition of organic materials can be hastened by increasing the surface area of the materials by shredding the materials. Blending refers to mixing of different types of organic residues to create favourable conditions for decomposition. Moisture is essential for the degradation of the organic materials. Optimum range of moisture for the composting is between 50 to 60 per cent. If moisture exceeds 60 per cent in the pile, the structural stability of the compost pile is reduced. The materials begin to compact and inhibit the aeration resulting in anaerobic condition within the compost pile. Too less moisture (below 40%) in the compost heap delays the composting process. Temperature is one of the key factor influencing biological activities in the composting process. With the increasing microbial activities the temperature increases. If temperature reaches beyond 40°C then mesophilic bacteria are replaced by thermophilic bacteria. Temperature may go up to 70-80 degree centigrade for 2 to 5 davs and then it cools down to ambient temperature. Temperature should be monitored closely during composting. Aerobic conditions are essential in composting to facilitate the activity of aerobic microorganisms. If the content of oxygen falls below 5 percent in the piles, the aerobes or aerobic microbes starts dying. 1. Stage of process-high oxygen levels is required early in the compost process. 2. Types of feedstock- the higher nitrogen content in the feedstock, the greater is oxygen requirement. pH is a measure of the acidity or alkalinity of a solution. Aqueous solutions at 25°C with a pH less than 7 are considered acidic, while those with a pH greater than 7 are considered basic (alkaline).The optimum pH range for most of the biological reactions is between 5.5 to 8.0. As the biological decomposition proceeds, the pH shifts to neutral. At lower pH, fungi are most dominant organisms facilitating the decomposition. At pH 6.5 to 7.5, bacteria dominate. If the compost heap has higher pH, ammonia gas may be generated and this may cause adverse odour resulting in the decline of microbial population decline and poor quality compost. 1. Composts are excellent soil conditioner. 2. 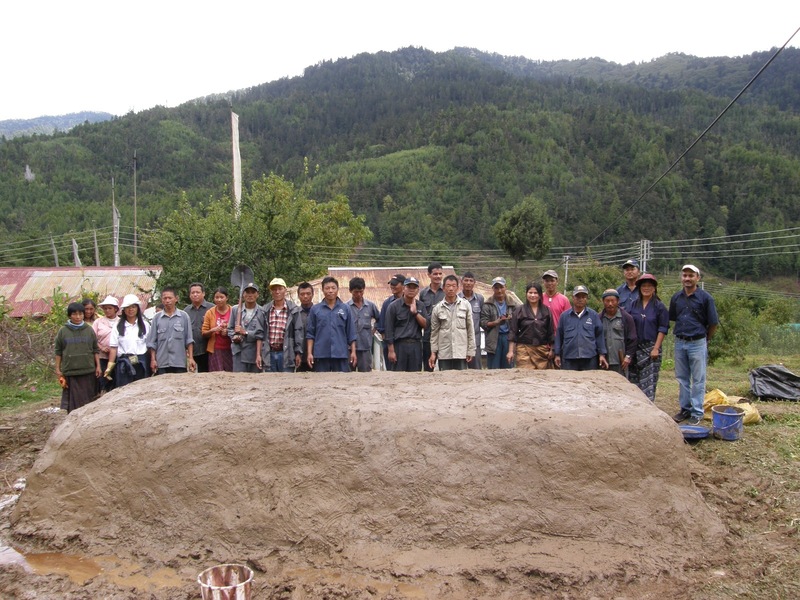 It improves soil structure, decreases soil bulk density and increases infiltration rate of water. 3. It increases soil buffering capacity. 4. Reduces Aluminum and Iron toxicity in acid soils. 5. It supplies growth promoting substances such as hormones. 6. Acts as a source of food for soil microbes and maintains microbial activity. 7. Increases soil organic, humic matter contents and overall fertility. 8. Reduces soil bulk density, facilitates plants to develop deeper roots. 9. Improves the Cation Exchange Capacity (CEC) which increases nutrient availability and reduces leaching. 10. Lead to overall soil aggregate stability, which allows the soil to function at optimum levels and get optimum yield. altitude, crops being cultivated, considering many such local factors. Very informative article on composting and importance of maintaining the Top Soil has been highlighted. If the soil is deep, fertile, easy to work and easy to manage, you will have little to do to improve it. P Phosphorous) & Potassium (K) as well as minor elements such as Fe (Iron) . 2.An excess of Acid also reduces the major nutrients, as well as quantity of Calcium. The acidity may lead to a surplus of Iron, Manganese and Aluminium which could produce toxic symptoms in the soil. 3.The ideal soil pH is "between "5.7 to 6.7. At this level most nutrients are held in a soluable state and therefore available to the plant. The soil is just like us human and is a living organism and is quite like the human body and is quite similar we examine various aspects like Air, Water, Nutrients, Cells (RBC) etc. Hence care of the soil is most important for Agriculture/Farming . In many parts of Karnataka Jeevamrutha has become popular . Advocated by Shri Subhash Palekar, Jeevamrutha has benefited the small farmers. A congenial environment is created for microorganisms that help in making available the essential nutrients for plant growth viz., nitrogen, phosphorus and potassium, to the plants. Jeevamrutha provides such an environment to beneficial microbes. Jeevamrutha when applied to soil improves the soil health by encouraging microbial activity in the soil. Soil under a tree or un-disturbed location form the same land - 2-3 handfuls. Mix all of them and keep them in a shade for 3-4 days. Stir the mixture once a day. Apply the mixture when the ground is wet for the plants. This seems to work wonders for the plants due to increased microbial activity by 3rd and 4th day. This is an excellent culture for enabling the exponential increase of beneficial microbes. The microbes are added thru 2-3 handful of local soil. Although it can be used even after 6-7 days, due to overpowering stench, it is advisable to use this within 3-4 days of preparation.